3" x 6" piece of Whisper White card stock, scored and folded at 3", rounded the 4 corners. Layered a coordinating 2-3/4" x 2-3/4" card stock , rounded the 4 corners. Layered a coordinating 2-1/2" x 2-1/2" DSP, rounded the 4 corners. 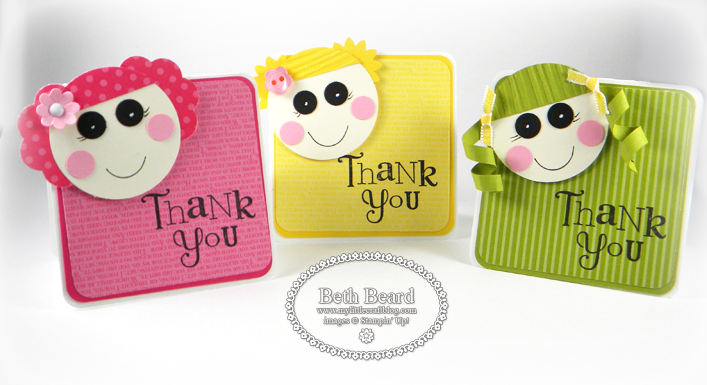 Stamped "Thank You", from the Wacky Wishes stamp set in Black StazOn. Attached punch art with Stampin' Dimensionals. To view the video for making the faces, click here. Please check back tomorrow, our final Lalaloopsy day, to see the treat boxes I made plus a video. These are so darned cute, Beth - I may make one as a Get Well card for a friend who is looking at surgery later this month. These are almost too darn cute for words Beth and so v v special. They are all the things that little gals love, bright, vibrant and cute with a capital "C"!! I think the green one is my fave...hard to go past those wee curls!! !